The bridge across the Rio Grande between Laredo, Texas, and Nuevo Laredo, Mexico, is only a few hundred feet long, but the apparent distance between the two cities is far greater. Like many American cities, Laredo is laid out in broad blocks with wide streets. Yet over half of its downtown blocks are empty and turned into parking lots because life in Laredo has moved to the fringes. Big block stores, strip malls and residential suburbs have sucked the life out of this American town, just as they have in so many towns from Texas to Maine. Recently, Laredo’s last bookstore closed. What still makes Laredo special, however, is it position on the border of Mexico, separated from Nuevo Laredo by the Rio Grande. 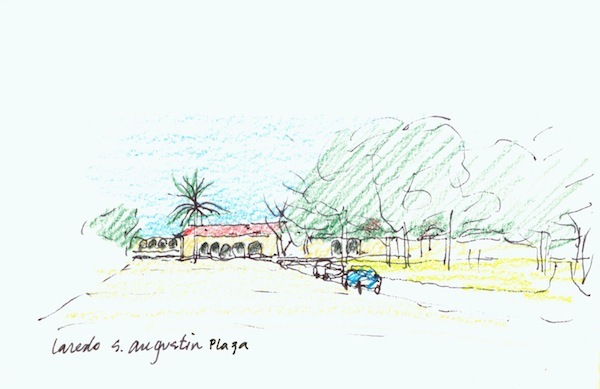 San Agustin Plaza, near the river, suggests Laredo’s Mexican heritage. Surrounded by stone and stucco buildings that look as though they were built when Texas belonged to Mexico, San Agustin Plaza is a quiet and sleepy place, with a well-tended lawn dotted with stately palm trees. Unfortunately, few people were there to enjoy it. A few hundred feet from San Agustin Plaza is the International Bridge, leading to Nuevo Laredo and the Plaza Juarez. And between the two plazas lies a tale of two cities. I visited both cities a year ago on a bright weekday morning in December. At lunch at the Posada Inn on the plaza in Laredo, my wife asked our waitress about visiting Nuevo Laredo that afternoon. Indeed, Laredo is at the apex of drug smuggling through Mexico to the USA, its streets “…awash in money, stacks of grimy bills tainted in cocaine residue…” according to a recent article in the New York Times. As the United States has tightened bank regulations to prevent money-laundering, more money from illicit drug sales is being smuggled across the border, wrapped in plastic and stowed in secret compartments built into the trucks, buses and cars that flow over the Mexican border. And a sluice-way of this river of drugs and money is the International Bridge at Laredo. I’ll admit it sounded a little frightening, this trip to Nuevo Laredo, if I believed the description of Mexico as a center of the drug trade. But my wife had been to Mexico and Nuevo Laredo many times since she was a child. Undaunted, she asked our waitress to recommend a guide, and twenty minutes later we were standing at the customs entrance to the International Bridge with Francisco Velasquez, our guide for an afternoon tour of Nuevo Laredo. The bridge was jammed with cars and pedestrians. At midpoint of the bridge, as though passing through an invisible barrier, we crossed into Mexico. Most of the pedestrians going to Mexico with us were carrying luggage or pushing carts stuffed with over-sized boxes of Corn Flakes, clothing and video games. We were now fifty feet above the Rio Grande, and the weather was sunny. Customs at the Mexican side of the bridge seemed casual. Leaving the bridge we came to Plaza Juarez, the twin, you might say, of San Agustin Plaza in Laredo. In contrast to the stately yet virtually empty plaza in Laredo, though, the plaza in Nuevo Laredo was bustling. People were coming and going in the shadow of live oak trees while older people sat on benches, children chased around the plaza, and teenagers watched each other. The buildings around the square were durable but rough, made of concrete and stone. 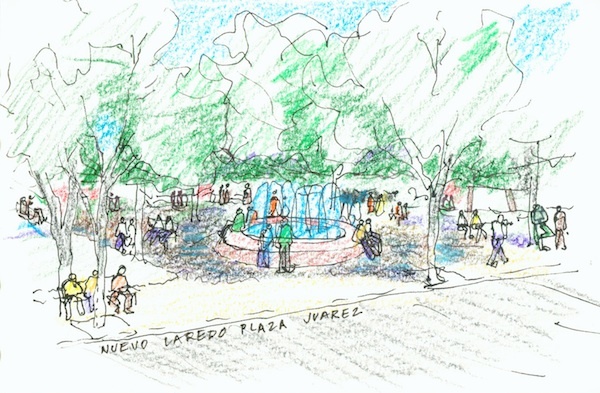 The plaza itself was paved in stone, in contrast to the lawn in Laredo. And every storefront around the plaza was occupied by a shop or cantina. We sat for a moment and watched the sunlight filter through the trees as children laughed and played around a fountain. Francisco told us that the people of Nuevo Laredo were renowned for their friendliness. During the afternoon he greeted over two dozen people on the street by name. But he was moving back to Laredo, he said, because his children had bought a house for him there. At one corner of the square we walked into “Marti’s,” a gallery that sold furniture, glass, pottery, jewelry and clothing—all handmade in Mexico, all woven or carved in the region where they were being sold, and all of a quality that told me the people who made them loved what they were doing. The shop itself was an aesthetic experience, approached through a pink stucco courtyard draped with vines where we could hear our footsteps. Entering we found a quiet, well-lighted interior, like a museum but a friendlier, where every object was affordable. After shopping for an hour we went to the Cadillac Bar down the street and drank freshly made limeades from tall glasses at a polished granite bar underneath a ceiling supported on stone columns. A group of Mexican businessmen dined at a long table nearby. No sign of drug barons. Eventually, we said goodbye to the bar manager and made our way towards the bridge. Outside a parade was forming. The Felice Navidad parade in Nuevo Laredo is held every year during the week before Christmas. While we’d been shopping, marching bands from many parts of the region had assembled in Plaza Juarez. At 4 p.m. they set off down Avenue Guerrero. The musicians were mostly young, everyone seemed to know each other, their uniforms didn’t always fit well, the music was out of tune, and the marchers were definitely not concerned about being in step. But it didn’t matter because the whole show was magnificent. Back in North America, we watch our bands in a stadium, we buy our lemonades in a drive-thru, and we shop for clothing in a mall. Here in Mexico we could do all three on a crowded city street. Here, life is the spectacle. How simple, I thought, and how incredibly pleasant. There is something to be said for finding pleasure in the everyday, because the most important things in life turn out to be quite simple: people, relationships, the shadow of oak leaves on the pavement, the laughter of children, the sound of a trumpet in a city. Simple pleasures that seem hard to find on the other side of the border come easily in Nuevo Laredo. At six in the afternoon most of the traffic going north on the bridge was pedestrian. The Mexican government had built awnings to shade the sidewalk on the bridge, and I imagined what a difference shade would make on a hot summer day. We crossed the international border, through a serious U.S. Customs hall, and climbed the hill beneath thousands of blackbirds on the telephone wires above us. How easily birds can cross the border. How complex it is for humans. I felt totally refreshed to have visited a culture so simple yet so rich. Ironically, many people in Nuevo Laredo would choose to live in Laredo if they could. And much of what I valued about the simplicity and richness of Nuevo Laredo is actually the result of its relative poverty. Sadly, one of the consequences of poverty is drug trafficking. Yet what we brought back from Mexico was profoundly legal: the simple enjoyment of the everyday. The pleasure we experienced in Nuevo Laredo a year ago is harder to come by now. In December of this year, the State of Texas warned its residents not to visit Mexico. In Nuevo Laredo, the “Cadillac Bar,” in business for over 50 years, closed along with many other restaurants that served tourists and locals. 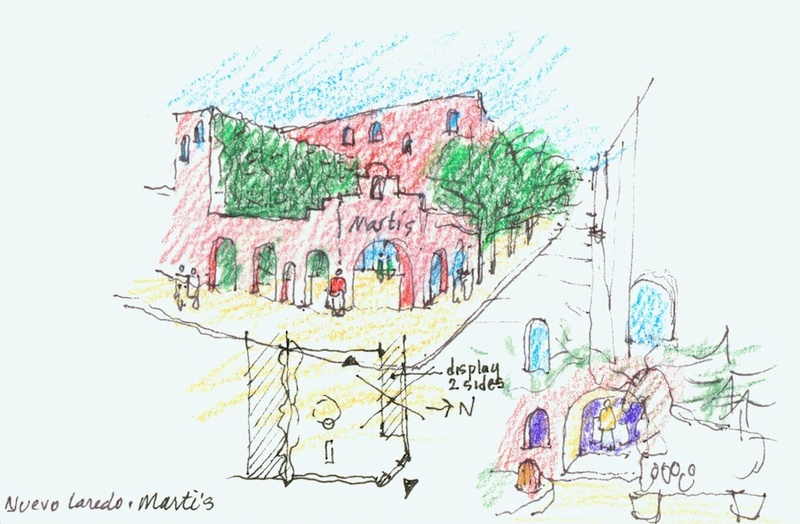 “Marti’s,” the gallery of Mexican craft and material culture, is moving north to San Antonio.